We’re always on the hunt for awesome things to do, and we’re huge fans of Kingdom Hearts, so we lost our collective minds when we found out that there will be Kingdom Hearts hotel rooms out at the Disney Ambassador Hotel in the Tokyo Disney Resort starting from March this year. These rooms will be available from March 26th – June 30th 2019 and are limited to three adults and come with two regular sized beds and one trundle bed. Prices are from 46,100 yen, or roughly £329/$424, and also the website teases that a “Special Menu” will also be available between March 26th and June 13th, but no further details are given. However, if this menu is anything like the fantastically appropriate (and tasty looking) themed menus at the Square-Enix Café then we’re sold! In a cute touch, you can open the doors to the rooms with a Keyblade-shaped key, which comes in a special box, and guests are given two sets that they can take home after their stay. 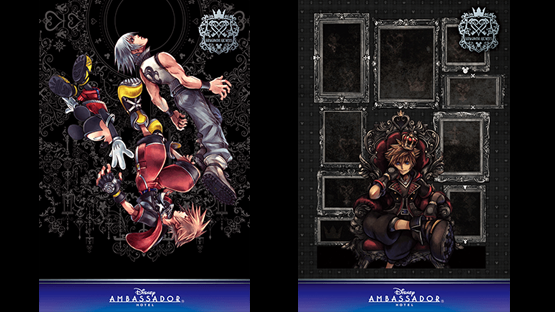 The hotel is also giving Kingdom Hearts postcards to take home, which look absolutely incredible too. So, you get some decent-looking merchandise just for staying there. We really want to go, as the rooms are beautiful, especially those themed tables that we would quite happily purchase ourselves (if they were available). What do you think though? 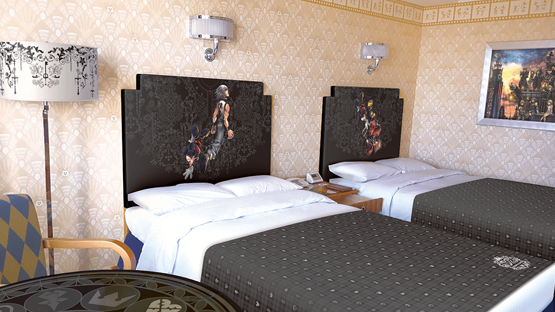 Would you stay in these Kingdom Hearts themed rooms? Do you want one of these Keyblade door keys as much as we do? Let us know in the comments, or on Facebook and Twitter, and check back for more awesome things from Japan! It’s possible to reserve a Kingdom Hearts room from January 30 and, given the popularity of the franchise, it’s likely that the rooms will sell out entirely. So, if you want to go, you should most definitely get on it as soon as it’s available. Kingdom Hearts III is out for Playstation 4, Xbox One, and PC on January 29th. Pre-order the game here!